Minimum number of playthroughs: 2 plus clean-up, 1 Overwatch run-through on both missions plus collectible clean-up, 1 run on survival, multiple rounds on MP. Glitched trophies: No glitched trophies, but the statistics for this game can be glitchy plus potential save wipes. See glitch notes. Does difficulty affect trophies? : Yes, the game has to be played on Authentic difficulty. See The Best of the Best of the Best for more information. Do trophies stack? : Yes, the difficulty trophies stack among other trophies. Do cheat codes disable trophies? : None known cheats. Welcome to the Sniper Elite 4 Roadmap and Trophy Guide. Rebellion brings back it’s Sniper Elite franchise for another year. 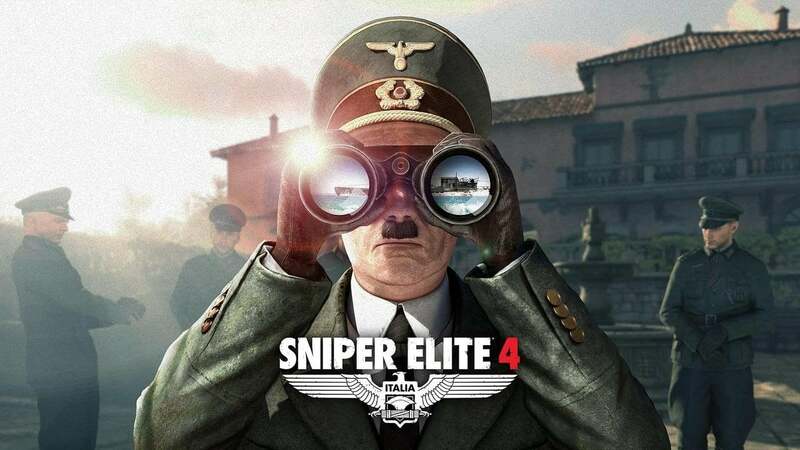 Sniper Elite 4 is set in Italy 1943, you control Karl Fairburne an OSS (Office of Strategic Services) agent who is tasked to help the Italian Resistance take on the Germans in World War II. The trophy list is your typical Sniper Elite trophy list, but unlike it’s predecessor, it isn’t mulitplayer heavy this year. However, there will be a lot of collectibles to collect plus you will have to play on the highest difficulty (Authentic). Step 1 – Complete the game on Cadet (easy)/Marksman (normal) difficulty collecting anything along the way. For this step, I would advise you to just play through the 8 story missions plus 2 Overwatch missions collecting anything along the way (completing the 2 Overwatch missions on Authentic isn’t needed). This will help you when you come to do your Authentic run. And any other trophies you may unlock. Step 2 – Complete the campaign on Authentic either solo and/or with a co-op partner. Also, don’t forget, no manual saves. Now that you’ve got the know how of where the enemies are, I would go straight into Authentic either solo or with a co-op partner. At least with a partner he/she can revive you at any given time. This step is used to gain any misc trophies you might have left plus clearing any collectibles you didn’t pick up on either runs. A majority of the kill related trophies can be easily done through solo survival on Cadet. Step 4 – Multiplayer plus Co-op – is needed. There are two multiplayer trophies for this game, but both can be done through private matches. There are also two co-op related trophies or Overwatch missions. There are also collectibles in these two Overwatch missions which are needed for their respective trophies. As ever collect all other trophies to add another platinum to your collection. Map: San Celini Island – 1 main objective, 2 Side objectives. Your main objective here is to locate and kill Hitlers most trusted Luftwaffe General Tobias Schmidt by any means neccessary. That’s a wrap – Destroy 3 cameras. Map: Bitanti Village – 1 Main objective, 3 Side objectives. Your main objective here is to locate the Partizan/Resistance HQ and a woman known as “Angel of Mercy” (Sofia). Search The Graveyard. The key can be found at the entrance of the church otherwise blow up the wall on the side entrance to the graveyard. Find and kill the Radio Operator before he can call reinforcements. Kill the sniper and retrieve the report. Map: Regilino Viaduct – 1 Main objective, 2 Side objectives. Your main objective is to destroy the railway gun being carried by the Locomotive. This is given to you by Sofia, so talk to her at the start of the mission. Locate and destroy the ammo cache. Story related, an cannot be missed. Map: Lorino Dockyard – 1 Main objective plus 2 additional primary objectives, 4 Side objectives. Find out what the Germans are transporting. Find out where they’re being sent. Destroy the armoured thread (x/2) – There will be at least 2 armoured tanks driving around. Locate and Assasinate the Harbour Master. Map: 2 main objective, 4 Side Objectives. Kill all the soldiers in and around Castle Hill. Art Appropiation – Call the truck convoy + Ring the bell. See I See You! for more information on what fully target focus is. Map: Magazzeno Facility – 4 Main objectives, 4 Side Objectives. Find Kessler and assassinate him. Find a way to disable the Radar Dish. Destroy the German Naval Guns (*/5). Assassinate the officer in charge of defences. Map: Giovi Fiorini Mansion – 3 Main Objectives, 2 Secondary Objectives. Find out what Rathbauer is hiding. Find route of propaganda truck and blow up the convoy. Map: Allagra Fortress – 4 Main Objectives, 2 Secondary Objectives. Note: You have to choose either a infantry or sniper. Being the sniper, you’ll be looking out for your team mate on the ground, so you can only go for the collectibles on the outside of the map while your team mate can only go for the collectibles on the ground, you will both be rewarded. Each and every weapon has it’s own upgrades. To master a weapon, you first need to master the first 3 upgrades then the mastery skin upgrade. Let’s take the M1903 Springfield for example (which will most likely be your main rifle). To get the mastery skin for this weapon, you first need to unlock damage, recoil, and zoom (these can change depending on what type of weapon you are going for this trophy). Once these are unlocked, you can then work on the mastery skin for this weapon which will then unlock this trophy once complete. Damage upgrade – 30 sound/masked shots. There are plenty of generators about alternatively, you can use the sound suppressor. Recoil upgrade – 50 shoulder-aim kills. To do this simply hold your trigger about half way before you go into zoom mode. Zoom upgrade – 20 kills over 100m. Self explanatory. Mastery skin – 20 heart shots. Simply aim for the middle of the chest. Self explanatory. You will most likely use your Welrod as much as your main rifle. Gain 100 kills with your Welrod or other pistols to unlock this. 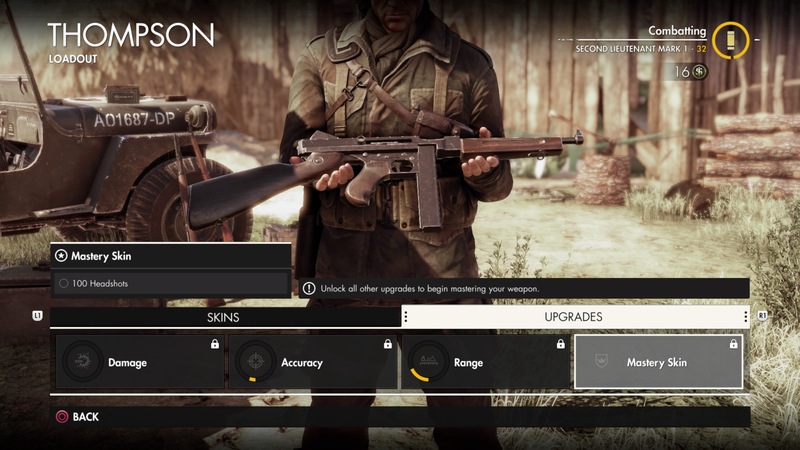 A secondary weapon will be your assault rifle like the Thompson. For this trophy simply load up any mission/survival on Cadet, and use your Thompson to unlock this trophy. Your sniper rifle will be your main weapon of choice, so this should be done by the time you even finish the story. If you have everything but this simply load up any mission on Cadet and grind out the remaining kills. To fully target focus an enemy, you first need to tag the enemy then let the ring around it go all the way round this means you have additional information on the target as well. If you just tag the enemy, you just know where they are which won’t count towards this trophy. See Following Orders for further information. Secondary objectives/optional objectives can be given to you via the resistance members that you see at the start of the mission. Some will become visible in the main mission as well. While going for this trophy, you will get the following trophies – Mother knows best and Weaver’s Warrior . For further information, see the respective chapter related trophies on what these secondary objectives are. Alternatively, you can find them in-game by pressing the then They will should up on the left-hand side. This will most likely be your last trophy in the game. You should have at least/close to half once you’ve finished everything. To grind out the remaining kilometres load up the mission “Regilino Viaduct”. From the start tag the enemies on the bridge as these are almost 200-500 meteres away from the start point of this mission. Make a save, then kill the tagged enemies. Reload your save rinse and repeat until you unlock this trophy. First off head to the player loadout and purchase the S-Mine. From here load up any mission you fancy and kill the first enemy you see (not blowing your cover). Make a save procede to booby trap the enemy you just killed with the S-Mine then make a save. Throw the body into an open space so that the other guards see it to investigate only to suffer the same fate. Load up your save rinse and repeat. It’s far easier this way since you’ll unlikely unlock this during your story run through. A great way to grind this out is to load the map San Celini Island. Once you get past the first 3 guards continuing sprinting until Karl says “That tower looks like a good vantage point”. From hear get the truck to see you, then plant an S-mine by the ammo box to where the truck parks. Quickly run away a tad and make a save. From here, you will just be exploiting the save feature. If done right, you should be getting 4 kills per load. See The Best of the Best of the Best for more information on how to unlock this trophy. To gain this trophy load up any mission and procede to the first enemy you see. Take out your pistol and shoot him in the foot, then pull out your sniper rifle and aim for the sweet spot (testicle) to unlock this trophy. The kill cam will confirm what kill you have and/or will come up when giving you experience. Any traps will do such as the Teller Mine, S-Mine or Trip Wire. The easiest way to do this is to simply load up any mission kill the first person you see and lay a Teller Mine or S-Mine on his body. If you don’t have any on you simply search corpses until you get some. To lay the trap on a body hold down then throw (hold down ) the body so other enemies can see it. Once one enemy sees the body, that enemy will come over to investigate only to suffer the same fate. As the description says these vehicles have to be manned for this trophy. There are plenty of manned tanks/manned pillboxes (gun turrets) around during your play through. The easiest way to stop the tank/vehicle is to shoot it’s gas tank (this won’t blow it up just slow it down). Making sure the turret driver can’t see you place the satchel charge on the back (you can also make a save before hand) and blow it up. Load up the save rinse and repeat. There are very few places you can gain this trophy, but one mission you can do this on is mission 6 (Magazzeno Facility). You will need a flare gun for this. These can be found on spotters which can be identified through the use of your binoculars. Once the spotter is dead loot him to grab the flare gun. You’ll probably get this without knowing. Snipers aren’t that hard to see in the game with their glowing glint from the scope in the distance, you also get a sound warning like a ding to warn you there is one in the area. So long as the sight bar is empty or yellow it will count. If the player sighted bar turns to red either restart the checkpoint or carry on due to there being plenty of snipers about. Killing snipers will sometimes be part of some secondary objectives as well. See Following Orders and the respective mission trophies for more information on how to gain this trophy. First off, you’ll have to make at least one run of the story as challenges won’t become available to you until after you’ve completed the mission even though they will be visible/can be tracked. Once the story is complete simply load up any mission on Cadet and complete it’s challenges. Each mission has 5 challenges. Bushwacker! – Get at least 10 foliage take downs – As the challenge states (Bushwacker!). Simply hide in bushes and lure enemies with whistling or your rocks. Take them out with melee kills You will know if it counts as it comes up when you get given the xp. Here you must gain a kill with every weapon (not DLC) you find in the player loadout. There are as follows 7 sniper rifles, 8 secondary weapons and 6 pistols. These can be bought (If you are buying the weapons, they will typically cost between $3-5. in-game currency), or picked up from safes, weapon armouries or enemies. 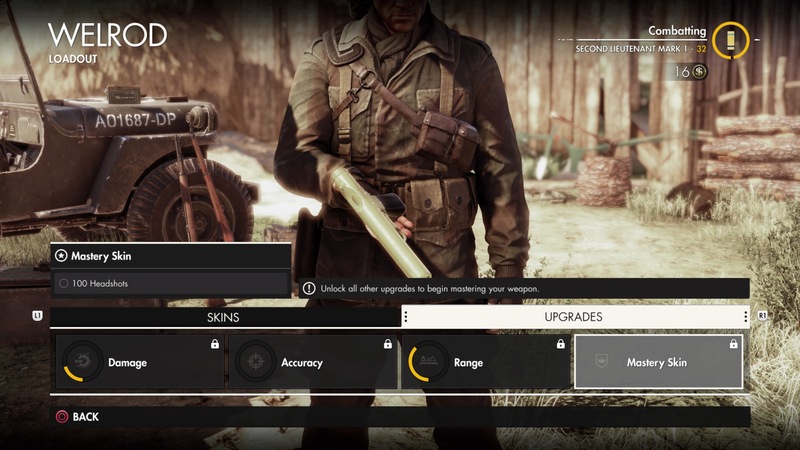 Lee-Enfield – To get this unlocked first you need to help the rebels win the Church Battle in mission 2 (Bitanti Village) and the battle for the Watermill in mission 7 (Giovi Fiorini Mansion) as well as completing both missions. If the challenges aren’t unlocking, then you can simply grab one along the way if you find it. Panzerfaust – Can be found on enemies, in both Overwatch mission, Lorino Dockyard weapons cache, Pre-order Target Fuhrer DLC armoury (need key). Cannot be bought. Just simply get a kill with whatever weapon you have at your disposal save and exit so the stats save. Make your way to the player loadout switch weapons rinse and repeat. 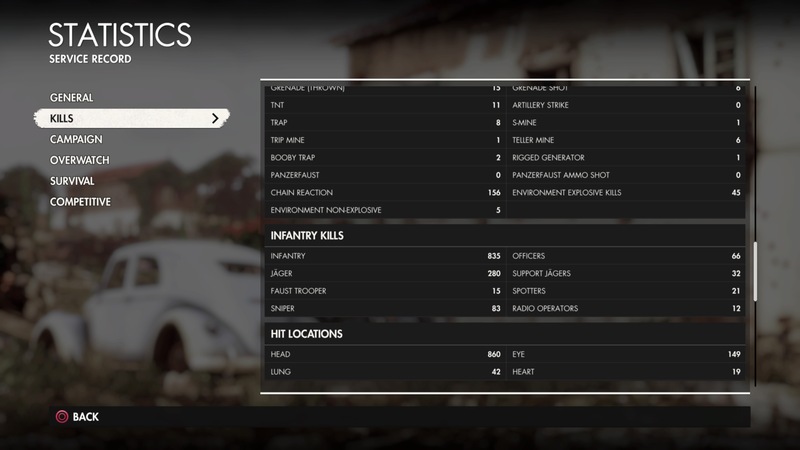 You can track your Panzerfaust and FG 42 in the statistics while your other weapons you can track through your challenges. Note: The Panzerfaust kill needs to be an enemy kill, not a vehicle kill. Surpressed ammo for your sniper rifle is hard to come by. If you use your Welrod all the time, then this will come without even noticing. As long as your weapon has a silent attachment to it, then the kills will count towards this trophy. If you are playing stealth, you will likely get this without noticing. If not, then load up any map and just go for the main objective(s). You can restart the checkpoints if you die, just don’t use any medkits/bandages during your run. Advised this is either done on easy/normal. There are many types of ways to kills enemies throughout the story. The most common one will be the Cargo Drop. Other ways are ledges, eagles, sea mines etc. Sea mines are not common throughout the story however, if you have the pre-order Target Fuhrer DLC there are plenty of sea mines on that mission. Simply get a kill with 3 of these environments to unlock this trophy. Load up any mission and go for the main objectives. Simply kill with your sniper rifle only. I would recommend you purchase the suppressed ammo in the player loadout for both slots to make things a little easier unless you like to go loud. If you have the Pre-Order Target Fuhrer DLC, then this will make this trophy far easier as the the map is smaller than the main missions. In total there are 50 Last Letters, 50 Letters from Home, 50 Letters to Home. These can be found in open spaces as well as on enemies, so search every enemy you kill. If you pull you binoculars out when tagging, it will show you whether that person has a collectible on them. Also, don’t forget about the 2 Overwatch missions. See A Most Singular Expert for more information on how to master the sniper rifle. Let’s take the Welrod and Thompson as prime examples as these are your starter weapons. To see how you are doing head to the player loadout click on your desired weapon > press > then for upgrades. Stone eagles can be found on top of buildings,. There are 30 Deadeye Targets for you to destroy with your rifle. Glitch warning: There is a visual glitch on mission 6 (Magazzeno Facility) showing 9 instead of 3. See The Collector for more information. Throughout the missions, there will be enemy snipers. These will carry sniper reports on them. This can sometimes be an optional objective as well. There are 27 Sniper Reports for you to collect. See Veteran for more information on how to get this trophy. If you are still missing some levels after you’ve completed everything, then you can grind out the remaining levels using the following exploit. This is providing you have the pre-order Target Fuhrer DLC (Credits for Reaper Reborn for this method). There are 8 different types of infantry. For more information head to service record > tutorial > enemies and allies. For more information/how you are doing see your statistics in the service record. Here you will be taking on waves of enemies. Also, there will be tanks near the end. This can be done on Cadet making it easier. There are 12 waves for you to complete while protecting your commend post which doesn’t matter if you lose it to the Germans, so long as you kill them all and move onto the next wave without dieing you’ll be fine. Although you can do this in quick play co-op, this isn’t a multiplayer trophy as you can find this in single player. Also, personally, it’s far easier to do on Cadet single player. There are 6 game modes for you to complete (not win). These can be done in private with a friend or with randoms. If the host ends, the game will end instead of looking for a new host this won’t count. Make sure you press when at the scoreboards at the end of the game, so that it goes to a “finishing game” screen. You can also join games in progress for this to count. If you aren’t boosting, then I would highly advise to use the game browser instead of quick match to look for the games needed. Alternatively, you can create one making it public, and wait for randoms to join. This can be done with randoms albeit annoying or with a friend through private match. To boost this, simply get your friend to start taking the radio point, then when the circle fills up to the bottom of the middle of the symbol simple hold to capture it. You have like a 2-3 second window to get this. You can do this as soon as the game starts, and you also have around 7 attempts to this in. As the description saves make sure you do not make any manual saves whatsoever during your authentic run. There is a checkpoin system (which is far more genourous then Sniper Elite III because there wasn’t any), so when it reaches the checkpoints the game auto-saves. This is fine. It is highly advised to just go for the main objectives on this, and as ever stealth where possible. 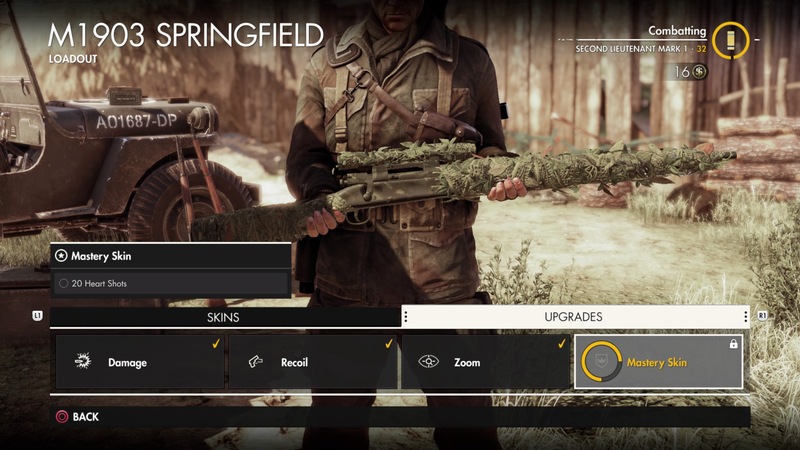 To gain more suppressed ammo for you sniper rifle, you can purchase two slots (three if you have the skill edited in the skill tree – level 30 needed) in the player loadout area (do this before you start your run). This is earned during Mission 8 “Allagra Fortress”. Right at the end of the mission General Bohm will be making his escape in his plane. When it swoops round after taking off, you will notice the missile drops from the cargo bay. Simply shoot it with your sniper rilfe to gain this trophy.